‘How can I most quickly improve?’ I asked him one day later on. ‘You must walk constantly in the forest,’ he answered; and he meant what he said to be taken literally. It was his own favourite prescription that he advised for my application. Brahms’ became Florence May’s teacher through the recommendation of Clara Schumann, and her well researched biography of him is a lovely read. It is, of course, very much caught up in the romanticism of the time — the more I read of it, like E.T.A. Hoffman’s work and his character Kriesler whom Brahms particularly loved, the clearer it all becomes. I never listen to it [string Sextet in B flat] without being carried back in thought to the gardener’s house on the slope of the Caecilienberg where, in my blue-papered, carpetless little room, Brahms sat at the piano and played it to me. The scent of flowers was borne in through the open lattice-windows, of which the green outside sun shutters were closed on one side of the room to keep out the blazing August sun, and open on another to views of the beautiful scenery. He especially loved Schubert. Me too. He had always been extremely careful, when selecting music for me to work at, to choose what would develop my technical power without straining my hands, and when I had wished to study something of his had answered that his compositions were unfit for me for the present, as they required too much physical strength and grasp. He fancied, indeed, at that time that nearly all of them were beyond a woman’s strength. When I asked why it was that he composed only such enormously difficult things for the pianoforte, he said they came to him naturally, and he could not compose otherwise (‘Ich kann nicht anders’). It is, of course, funny to me to think of a single piece being so difficult for a privileged musician that they have to retire to the country after playing it. But still, I find this understanding of music’s power and its toll on the body fascinating. 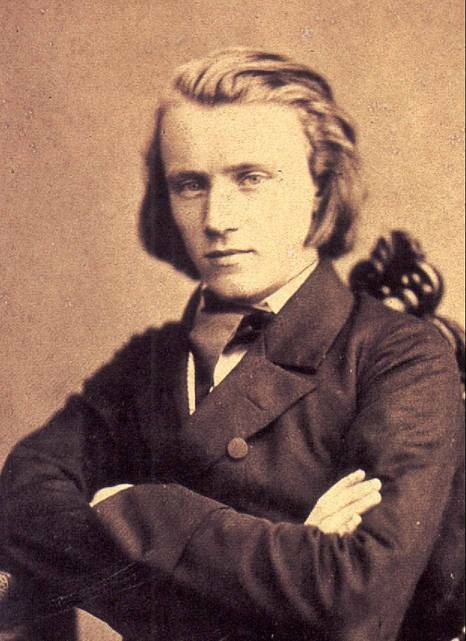 Johannes Brahms was the son of Jacob Brahms — an impoverished guild musician, whose own career in contrast to that of his son offers some insight into the difference between everyday musical cultures and high culture, and the many links between guild musicians and age-old folk melodies and new music hall tunes, standing in very distinct contrast to high classical standards and the classical compositions demanded by royalty and high society. There existed, not far from his home, a representative of the old ‘Stadt Pfeifereien,’ establishments descended directly from the musicians’ guilds of the Middle Ages, whose traditions lingered on in the rural districts of Germany for some time after the original institutions had become extinct. The ‘Stadt Pfeiferei’ was recognised as the official musical establishment of its neighbourhood, and was presided over by the town-musician, who retained certain ancient privileges. He held a monopoly for providing the music for all open-air festivities in the villages, hamlets, and small townships within his district, and formed his band or bands from apprenticed pupils, who paid a trifling sum of money, often helped with their manual labour in the work of his house and the cultivation of his garden or farm, and, in return, lived with him as part of his family and received musical instruction from himself and his assistants. At the termination of their apprenticeship he provided his scholars with indentures of character and efficiency, according to desert, and dismissed them to follow their fortunes. Country lads with ambition, who desired to see something of the world, or to attain a better position than that of a peasant or journeyman, would persuade their parents to place them in one of these establishments. They were expected to acquire a practical knowledge of several instruments, so as to be able to take part upon either as occasion might demand, and the bands thus formed were available for all local functions. It is not easy to imagine the feelings of this youth of nineteen or twenty on his arrival, fresh from the simple life of the Ditmarsh peasants, in the great commercial fortress-city, still the old Hamburg of the day, with its harbour and shipping and busy river scenes; its walls and city gates, locked at sunset; its water-ways and bridges; its churches and exchange; its tall, gabled houses; its dim, tortuous alleys. Refined ease and sordid revelry were well represented there; the one might be contemplated on the pleasant, shady Jungfernstieg, the fashionable promenade where rich merchants and fine ladies and gay officers sat and sipped punch or coffee, wine or lemonade, served to them by the nimble waiters of the Alster Pavilion, the high-class refreshment-house on the lake hard by; the other, in the so-called Hamburger Berg, the sailors’ quarter, abounding in booths and shows, small public-houses, and noisy dancing-saloons, in which scenes of low-life gaiety were regularly enacted. Johann Jakob Brahms was destined to appear, in the course of his career as a musician, in both localities. He made his debut in the latter. Thrown entirely on his own resources, with a mere pittance in his pocket for immediate needs, he had to pick up a bare existence, as best he could, in the courtyards and dancing-saloons of the Hamburg Wapping. The street where Brahms was born is also long gone, so it is wonderful to have such a description of it, along with an old photograph. 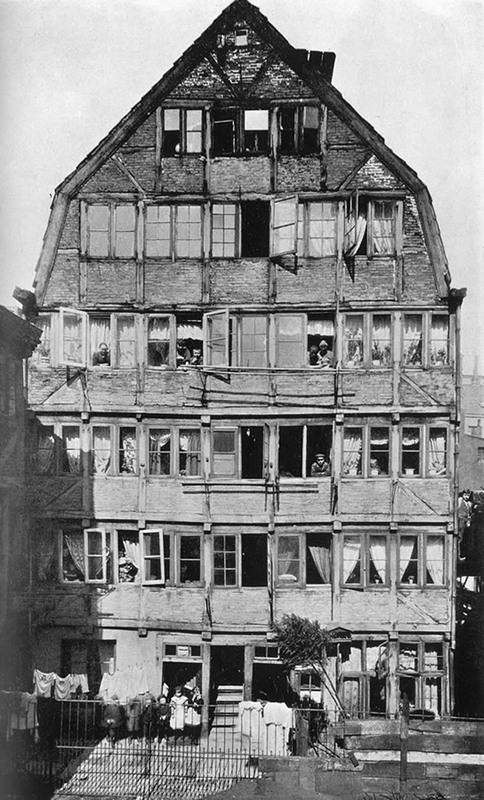 The house in which Johannes Brahms was born still stands as it was seventy years ago, and is now known as 60, Speckstrasse. The street itself, which has since been changed and widened, was then Speck-lane, and formed part of the Gaenge-Viertel, the ‘Lane-quarter’ of the old Hamburg. Want of space within the city walls had led to the construction of rows of houses along a number of lanes adjacent to one another, which had once been public thoroughfares through gardens. A neighbourhood of very dark and narrow streets was thus formed, for the houses were tall and gabled, and arranged to hold several families. They were generally built of brick, loam, and wood, and were thrown up with the object of packing as many human beings as possible into a given area. The Lane-quarter exists no longer, but many of the old houses remain, and some are well kept and picturesque to the eye of the passer-by. Not so 60, Speckstrasse. This house does not form part of the main street, but stands as it did in 1833, in a small dismal court behind, which is entered through a close passage, and was formerly called Schlueter’s-court. It would be impossible for the most imaginative person, on arriving at this spot, to indulge in any of the picturesque fancies supposed to be appropriate to a poet’s birthplace; the house and its surroundings testify only to the commonplace reality of a bare and repulsive poverty. A steep wooden staircase in the centre, closed in at night by gates, leads right and left, directly from the court, to the various stories of the building. Each of its habitations is planned exactly as every other, excepting that those near the top are contracted by the sloping roof. Jakob and Johanna lived in the first-floor dwelling to the left on facing the house. On entering it, it is difficult to repress a shiver of bewilderment and dismay. The staircase door opens on to a diminutive space, half kitchen, half lobby, where some cooking may be done and a child’s bed made up, and which has a second door leading to the living-room. This communicates with the sleeping-closet, which has its own window, but is so tiny it can scarcely be called a room. There is nothing else, neither corner nor cupboard. Where Jakob kept his instruments and how he managed to practise are mysteries which the ordinary mind cannot satisfactorily penetrate, but it is probable that his easy-going temperament helped him over these and other difficulties, and that he was fairly content with his lot. If Johanna took life a little more hardly, it is certain that husband and wife resembled each other in their affection for the children, and that the strong tie of love which bound the renowned composer of after-years to father and mother alike, had its earliest beginning in the fondness and pride which attended his cradle in the obscure abode in Schlueter’s-court. 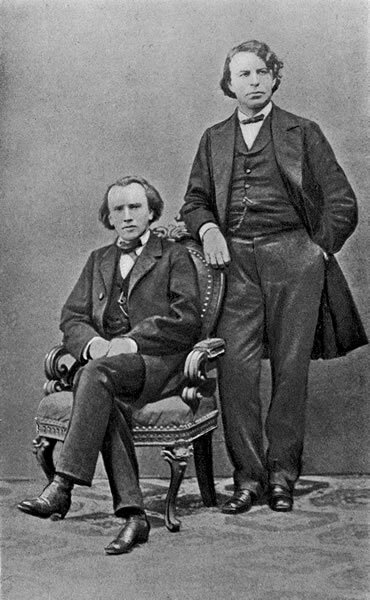 Coming from this background, Brahms was able to acheive all he did with the help of his father and the musicians guild, who not only taught him, but also raised funds so that he could be more classically trained. The upshot of these things was that, a few months after the interview with Marxsen, a private subscription concert was arranged ‘for the benefit of the further musical education’ of Johannes, which took place in the assembly-room of the Zum Alten Rabe, a first-class refreshment-house, long since pulled down, that stood in its own pleasure-garden near the Dammthor. The programme included a Mozart quartet for pianoforte and strings, Beethoven’s quintet for pianoforte and wind, and some pianoforte solos, amongst them a bravura piece by Herz, the execution of which, by the youthful concert-giver, seems to have caused immense sensation in the circle of his admiring friends. To us, who belong to a generation that has been educated on the purist principles first made widely acceptable by Mendelssohn’s influence and since popularized by the genius of a few famous executants, with Clara Schumann, Rubinstein, and Joachim at their head, it is difficult to realize the revolution that has taken place in the general condition of musical art since the days when Marxsen, three years Mendelssohn’s senior, was young. Many things were then accepted and admired in Vienna, in Berlin, in Leipzig, in London, which would now be regarded as impossible atrocities. Marxsen was capable of setting the Kreutzer Sonata for full orchestra, but this is hardly so surprising as that the Leipzig authorities should have produced the arrangement at one of the Gewandhaus concerts, or that Schumann should have mentioned it indulgently, on whatever grounds, in the Neue Zeitschrift fuer Musik. ‘Teaching them to form a texture…’ I quite love seeing music like that. Under Marxsen’s tutelage he gave his first public concert, and May is delightful enough to not just give the playlist, but her commentary. 1. Adagio and rondo from Rosenhain’s Concerto in A major for Piano, performed by the concert-giver. 2. Duet from Mozart’s ‘Figaro,’ sung by Mad. and Fraeul. Cornet. 3. Variations for Violin, by Artot, performed by Herr Risch. 4. ‘Das Schwabenmaedchen,’ Lied, sung by Mad. Cornet. 5. Fantasia on Themes from Rossini’s ‘Tell,’ for Piano, by Doehler, performed by the concert-giver. 6. Introduction and Variations for Clarinet, by Herzog, performed by Herr Glade. 7. Aria from Mozart’s ‘Figaro,’ sung by Frl. Cornet. 9. a) ‘Der Tanz’ } Lieder, sung by Mad. b) ‘Der Fischer auf dem Meer’ } Cornet. c) Etude by Herz, performed by the concert-giver. Unattractive as it now seems, this selection of pieces was no doubt made with a view to the taste of the day, and the inclusion of a single Bach fugue was probably a rather daring concession to that of the concert-giver and his teacher. The four or five years immediately succeeding his formal entry into life were, perhaps, the darkest of Brahms’ career. Money had to be earned, and the young Bach-Mozart-Beethoven enthusiast earned it by giving wretchedly-paid lessons to pupils who lacked both talent and wish to learn, and by his night drudgery amid the sordid surroundings of the Hamburg dancing-saloons. Particularly in migrants’ shifting relationship with authority. It was to be Reményi, refugee that he was, who would make it possible for Brahms to gain introduction to those who would champion his talent and make it possible for him to find the time and space to perfect his skill and compose music. On to more of the politics of the German music world! The musical world of Leipzig, the city raised by the leadership of Mendelssohn to be the recognised capital of classical art, had become split after the death of the master in November, 1847, into two factions, both without an active head. The Schumannites, whilst receiving no encouragement from the great composer whose art they championed, decried Mendelssohn as a pedant and a phrase-maker, who, having nothing particular to say, had covered his lack of meaning by facility of workmanship. The Mendelssohnians, on the other hand, declared Schumann to be wanting in mastery of form, and perceived in his works a tendency to subordinate the objective, to the subjective, side of musical art. The division soon spread beyond Leipzig throughout Germany, and, in the course of years, to England, with the result that Mendelssohn, once a popular idol, is now rarely represented in a concert programme. Brahms in fact meets Liszt in this first halcyon trip along the Rhine where it seems as the whole world opens up to him. Apparently this first meeting is famous and they didn’t get along. But did Brahms nod off? It didn’t really matter, he was a hit, and from there he would only move up from recognition to recognition. He certainly touched Joachim’s heart by his loving talk of Hamburg, rich in proud traditions, and not without art memories of its own, associated with the great names of Klopstock and Lessing, of Telemann and Keiser, of Handel and Mattheson and Emanuel Bach. It is highly interesting to possess a clear conception of Brahms’ achievements as a composer, and, therewith, of his exact title to consideration at this important moment of his career. This will be best obtained by a glance at the list[Pg 281] of the chief completed works with which he was to present himself in the city associated with the most hallowed memories of his art. His departure for Vienna is by no means to be regarded as coincident with the close of any one period of his creative activity, though it emphatically marks the end, not only of a chapter, but of the first book of his life. List of Brahms’ Chief Completed Works on his Departure for Vienna. Variations on Schumann’s theme in F sharp minor. Variations on a Hungarian song. Variations and Fugue on Handel’s theme. Pianoforte Duet: Variations on a theme by Schumann. Pianoforte with Orchestra: Concerto in D minor. Sextet in B flat for Strings. Trio in B major for Pianoforte and Strings. The newly-finished String Quintet is not included in the list, as the work was not published in this its first form. The Hungarian Dances, as being arrangements, are also omitted.